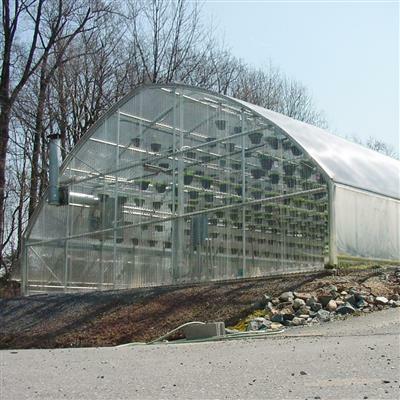 A professional package to get you started in the greenhouse business - The Economy Starter Greenhouse Package (Ranger Series 2000 Greenhouse) can provide year-round production for propagation and growing, retail garden centers, aqua culture, and provides the most square footage for the dollar as an instructional or institutional greenhouse. 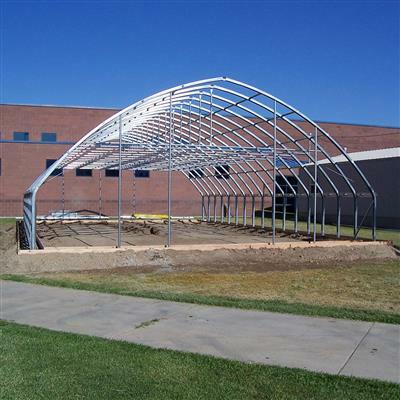 The frame of this structure is constructed from the same high quality, galvanized steel roll-formed components as our more expensive packages. The difference is the end walls of this structure are covered with beautiful, clear corrugated polycarbonate while both the sidewalls and roof are covered with a 4-Year rated, economical double-layer poly film. Many commercial greenhouses use the poly film on a permanent basis, but if you should choose to upgrade at a later time when your greenhouse is turning a profit, your roof can easily be retro-fitted with corrugated or twinwall polycarbonate. Rated in accordance with Uniform Building Code for 10, 20 or 30 Pound Snow Load. Guaranteed for 10 years against discoloration. Connect to and inflate airspace in two layers of polyethylene film from roof to side wall. Provides secure attachment of polyethylene film. Have peace of mind during high winds. Reusable time after time. Sturdy aluminum storm door, includes sliding screen assembly for use during hot weather. 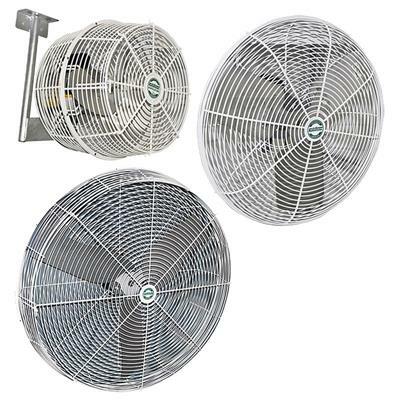 These fans offer high CFM capacity and low energy costs. Designed for year-round ventilation and summer cooling. Motorized inlet shutters provide a positive shut-off when fans are not in use. Provides plenty of air when cooling is required. Commercial grade thermostats designed for the humid greenhouse environment. Heating thermostat controls gas heaters to give exact temperature control. Two stage cooling thermostat provides individual cycling of fans for energy savings and uniform temperature control. The standard of the industry. 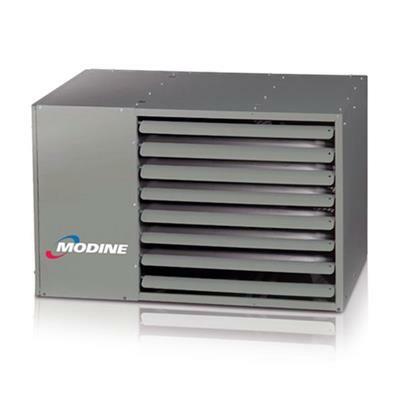 Rugged Modine as heaters provide long life and reliable operation. Heater is sized for 60 degree temperature difference between indoor and outdoor temperature. HAF fans provide constant air circulation within the greenhouse space. Promotes better plant health by reducing disease caused by condensation on plant leaves. Also distributes heat evenly when gas heaters are operating. All Ranger Greenhouses are engineered to meet at least 70 mph wind and 10 pound live load per the UBC Building Code, with higher wind and live load ratings easily available upon request. The free style gothic arch is designed to reduce roof snow build-up and provide maximum headroom. All galvanized steel frame insures maximum strength and life. 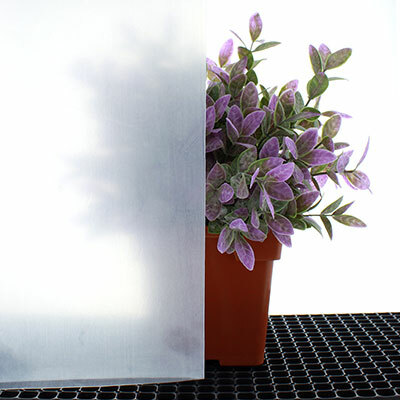 The twin-wall polycarbonate covering is UV resistant and carries a 10-year warranty against discoloration. Rollformed components incorporate the same design principle applied to industrial "I" Beams. 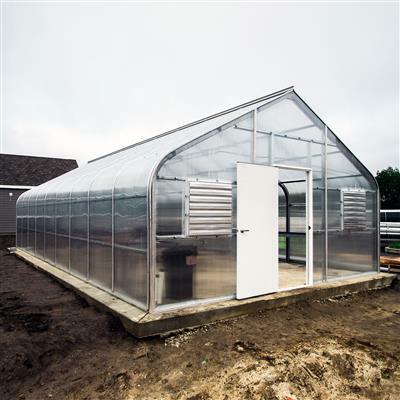 Engineered to be longer than wide, these rollformed members offer substantially greater resistance to the deflection causing forces of rain, snow and wind when compared to conventional greenhouse components. As condensation forms inside a greenhouse, it runs down the roof until it reaches an obstacle such as a purlin. In standard greenhouse designs, the condensate falls to earth upon contact with the purlin. Our truss and purlin assemblies, however, incorporate unique built-in anti-drip channels which intercept the condensate, effortlessly directing it away from people and plants. 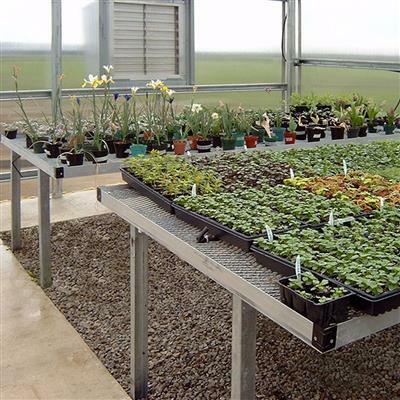 Hire our experienced construction team to assemble the greenhouse and install all working components. 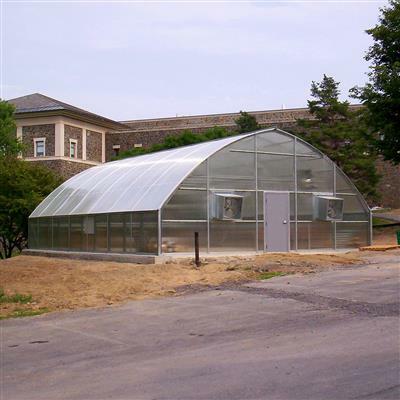 In addition to providing an easy single source solution, Turnkey Greenhouse Construction by Greenhouse Megastore allows you to spend time managing your business instead of running a construction project. Use a local contractor to erect the structure. Components supplied are pre-cut and drilled and your package includes shop drawings and/or general installation instructions which should provide sufficient guidance for an experienced contractor. Greenhouse Megastore provides online and telephone support to answer any questions your contractor may have. Jobsite Supervision: For a daily fee we will send an experienced job foreman to provide guidance and direction for any phase of your project. For information on how best to plan your greenhouse assembly and construction prices, call our Sales Representatives toll-free at 1-888-281-9337. We understand that you may want to talk to an actual person instead of ordering online. Call us toll-free at 1-888-281-9337 to speak to a Sales Representative.